Bullz-Eye has been invited by the auto manufacturers to review many new vehicles at drive events scheduled for the press. We’re happy to give our readers an early look at new cars about to hit the market. The all-new 2017 Kia Sportage delivers a completely updated version of the crossover utility vehicle that makes its competitive price even more enticing. We drove the new 2016 Nissan Sentra on a gorgeous, sunny day in Orange County with some spectacular coastline views and plenty of city driving settings. If you care more about a fun driving experience than the usual creature comforts, the limited edition 2015 Alfa Romeo 4C is the sports car for you. Though its six-figure price tag will scare off most consumers, the 2016 Nissan GT-R is one of the more affordable supercars currently on the market. The distinctive look of the 2016 Kia Optima will keep consumers coming into showrooms, while the driving experience will ensure that they stay interested. Mazda prides itself on building cars that are fun to drive, and the company's redesigned MX-5 roadster definitely delivers. With significant improvements made on the exterior, interior and under the hood, the new 2016 Nissan Maxima is ready to compete in the sport sedan market. Boasting a compelling new design and upscale interior to match, the 2015 Nissan Murano should attract plenty of attention in the crossover market. Though its improvements may seem subtle, the 2015 Honda CR-V continues its reign as one of the best compact SUVs on the market. Those looking to enter the luxury sports sedan market should check out the new 2015 Acura TLX, boasting smart styling, lavish interior and superb handling. After test driving the 2015 Dodge Challenger Hellcat, there's no question that it raises the bar for American-made muscle cars. The all-new 2015 Dodge Challenger is a true American muscle car that's a ton of fun to drive, boasting a powerful engine and several different trim options. Hyundai staked its claim on the mid-sized sedan market with the previous version of the Sonata, and the brand will likely cement its position with this new model. Hyundai has made some big changes to their flagship Genesis that makes it a serious competitor in the luxury space. We test drove the all-new 2014 Corvette Stingray on the back roads of Monterey and it surpassed our expectations. The all-new 2014 Nissan Rogue has been completely redesigned to ensure that it continues to be a strong competitor in the compact SUV segment. For those in the market for a more environmentally friendly car, the new 2014 Honda Accord Hybrid is a great option without breaking the bank. Nissan continues to amaze with the 2013 Versa Note five-door hatchback, featuring best-in-class fuel efficiency and a stylish but practical design. The 2013 Acura MDX is a family-friendly vehicle that's loaded with all the amenities you'd expect from today's luxury CUVs. Featuring more room and enhanced performance, the 2013 Hyundai Santa Fe GSL and Limited are great additions to the CUV segment. The winding roads of Napa Valley were the perfect place to test Acura's impressive flagship luxury sedan, the new RLX. The redesigned Mazda6 is a force to be reckoned with in the mid-sized sedan market, a beautiful car that's fun to drive. The 2013 Nissan Sentra is an excellent option in the compact car segment with competitive features and gas mileage. The 2013 Nissan Pathfinder remains an excellent option for SUV buyers, perfect for families or those with an active lifestyle. The Honda Accord has a reputation for being a solid and reliable family car, and that hasn't changed one bit. Hyundai targets young families with their practical but well-styled and competitively priced Santa Fe. With performance to match its impressive styling, the 2013 Hyundai Veloster Turbo is a great value for any young buyer. With a fresh new look and great gas mileage, the 2013 Nissan Altima rivals the perks of a luxury sedan for a much lower price. Acura's newest edition of the RDX addresses all the quirks of the last model and delivers a better driving experience as a result. The new ILX is a mature step up from mass-market brands, but it's held back by several annoying compromises. The 2013 Hyundai Azera marks the return of the full-size sedan with an all-new look and modern quality and fuel economy. The 2013 Infiniti JX is the perfect SUV for families that want a little extra space without sacrificing luxury and style. We traveled up to Michigan on a crisp November day to test drive the all-new CR-V and came away very impressed. We test drove this sharp, three-door coupe in Michigan on a beautiful fall day. We caught the unveiling of this new crossover at the Frankfurt Motor Show. We drove the completely redesigned 2012 Hyundai Accent on the roads of Ann Arbor and were pleased by its design and value. 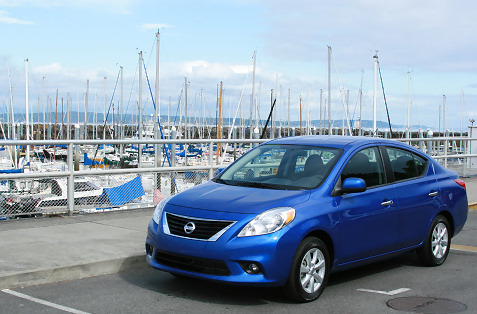 We drove the all-new Nissan Versa on a summer day in Seattle, featuring an updated look and performance. We drove the new 2012 Hyundai Genesis in Ann Arbor and came away impressed by its luxury features and affordability. Nissan ventured outside the box with the Murano Cabriolet, the first vehicle in the crossover convertible segment. Just keep reminding yourself that it's a crossover and not a sport coupe. Nissan's bold new entry in the sport crossover market has head-turning styling and an engine with a nice kick. Sporty, affordable and fun to drive with solid fuel efficiency, the 2011 MAZDA2 is a real option for first-time buyers.